Print is not dead! In fact, it is still an integral part of many marketing campaigns and it is also necessary for live events. There are a variety of print ad and design applications that are still a needed and popular aspect for your marketing campaign and brand recognition. Here at Balta Design, we specialize in high quality print ads and print design that will surely make your brand stands out. 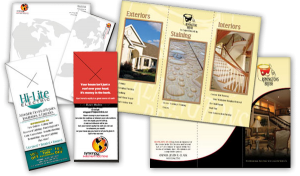 We also have a variety of options and utilize innovative printing techniques for your print ads to help you truly get the brand identity you desire. The materials we use are of the highest quality and will surely make just as much of an impression as the ad and design itself. If you have any questions about our print ad services in St. Charles or if you would like more information on our other services such as digital marketing, give us a call at 630-492-0147 today. You can also reach us by clicking on the Request A Quote tab on the right side of this page and we will return your inquiry as soon as possible. When you partner with Balta Design for your print ads and design, we will work hard to construct your company’s identity to look clean, crisp, and professional at prices that will fit within your budget. We use rich colors and smooth tones that will highlight the quality and design of your print ad. Our paper is of the highest quality, producing thicker and richer looking materials. For more information on our print ads in St. Charles or if you have any questions regarding our other services such as website design and SEO, call us today at 630-492-0147. Or click on the Request a Quote tab on the right and we will be in touch shortly.